Chairman Udall and Members of the Subcommittee, thank you for the opportunity to appear today as Associate Administrator for NASA's Science Mission Directorate (SMD). It's been my privilege to serve as Associate Administrator for almost a year now, and I want to acknowledge the support of SMD's exemplary management team over what has been an extremely busy and productive year. These are exciting times for the nation in the Space and Earth sciences. NASA satellites have observed interactions among oceans, atmosphere and ice to show how changes in the polar regions may reflect and portend global changes in climate. Elsewhere in the solar system, our MESSENGER (Mercury Surface, Space Environment, Geochemistry and Ranging) spacecraft just gave humanity its first look at the unmapped hemisphere of Mercury. Cassini continues to reveal new features of the moons and rings of Saturn, and of Saturn itself and its magnetosphere. The Great Observatories space telescopes (Hubble, Chandra and Spitzer) are giving us tantalizing clues of the nature and distribution of dark energy in the universe and revealing the characteristics of planets that circle other stars. The intrepid Voyager spacecraft are returning data from the termination shock where the shell formed by solar wind encounters interstellar space. The Aeronomy of Ice in the Mesosphere (AIM) spacecraft, launched in 2007 is providing revolutionary data on changes in noctilucent clouds that appear to be related to global change. These are but a few examples of exciting developments in NASA's space and Earth sciences program. In 2007 NASA launched four new orbital and planetary science missions ( Time History of Events and Macroscale Interactions during Substorms (THEMIS), AIM, Phoenix, and Dawn), two major airborne Earth science campaigns, plus some rapid-response airborne remote sensing aid to the California wildfire emergencies, and the first test flights of the Stratospheric Observatory for Infrared Astronomy (SOFIA) 747 airborne infrared observatory--all without any significant mishap or malfunction. Solar Dynamics Observatory (SDO). We also continue the development of a Landsat follow-on mission and four other NASA Earth science missions, as well as a bevy of space science missions. And, we look forward in 2008 to the next MESSENGER flyby of Mercury (in October), the Phoenix Mars landing (in May), and the NASA Exploration Systems Mission Directorate's launch of the Lunar Reconnaissance Orbiter (LRO) and Lunar Crater Observation and Sensing Satellite (LCROSS) lunar missions. These accomplishments and others in our program of over 90 flight missions and over 3,000 research grant activities describe a current program that is healthy, vigorous, and a model for the world. However, as we look ahead we are confronted with a series of challenges. NASA has heard repeatedly from the scientific community that its portfolio of missions has become too heavily weighted toward large missions at the expense of small and medium size opportunities. One of the most harmful consequences of this imbalance was a steep reduction in the number of opportunities for flight research, particularly in the 2010 to 2012 time period. Beyond the difficulties that this imbalance imposed on the current program, a lack of smaller "entry level" opportunities creates significant challenges as we seek to develop a skilled and capable cadre of investigators for the future. In addition, a decline in available resources for Research and Analysis (R&A) had the potential to exacerbate these problems and reduce the science return from the investments we make. As we worked to develop the FY 2009 budget request we sought to address these issues by increasing the flight rate, rebalancing planned missions in favor of medium and small missions, increasing suborbital missions, and reversing the downward trend in funding for R&A. In addition, we adopted two additional budget priorities: accelerating progress on the new Earth Science Decadal Survey report; and building a lunar science community. The President's FY 2009 budget request for NASA succeeds in implementing these goals while remaining within the planned Science Mission Directorate budget runout. This has been accomplished by launching numerous missions last year and thereby opening cost wedges for new missions; more closely managing costs; re-phasing the development of several missions; avoiding some cost overruns; and pursuing economies in the operations budgets for a number of missions. Looking to the future, it will be critical to continue to attack what is arguably the root cause of the imbalances we redress in the FY 2009 budget request: cost growth for missions in development. For at the end of the day, no strategy for maintaining a balanced program can succeed for long in the absence of disciplined program management. Ice Cloud and land Elevation Satellite (ICESat-II) will use lasers to measure the heights of icesheets around the world to support climate change diagnosis and analyze forest canopies to inform our understanding of the carbon cycle. ICESat-II is planned for launch in 2015 and will be managed by NASA's Goddard Space Flight Center (GSFC) in Maryland. Soil Moisture Active-Passive (SMAP) will observe soil moisture and freeze-thaw cycles to expand our understanding of weather and the water cycle. SMAP is planned for launch in 2012 and will be managed by the Jet Propulsion Laboratory (JPL) in California. Joint Dark Energy Mission (JDEM) will measure cosmological parameters to explore the unseen dark energy that makes up most of the expanding universe. JDEM is planned for launch in 2014-2015 and will be managed by NASA's GSFC. JDEM is a joint mission with the Department of Energy. Outer Planets Flagship will travel to one of three extremely interesting moons of the outer planets (Europa, Titan, or Ganymede) that may have the potential to support life. The Outer Planets Flagship is planned for launch in 2016-2017 and will be managed by the JPL. Lunar Atmosphere and Dust Environment Explorer (LADEE) will explore and characterize the moon's tenuous atmosphere. LADEE is planned for launch in 2010-2011, and will be managed by NASA's Ames Research Center with its program office at NASA's Marshall Space Flight Center (MSFC) in Alabama. Lunar Network Landers will establish two nodes of a planned international seismic network for monitoring the moon's internal processes. The landers are planned for launch in 2013-2014, and will be managed by NASA's MSFC. Solar Probe Plus will fly through the Sun's atmosphere or "corona" to understand how the Sun's corona is heated and how the solar wind is accelerated. Solar Probe Plus is planned for launch in 2015 and will be managed by NASA's GSFC. 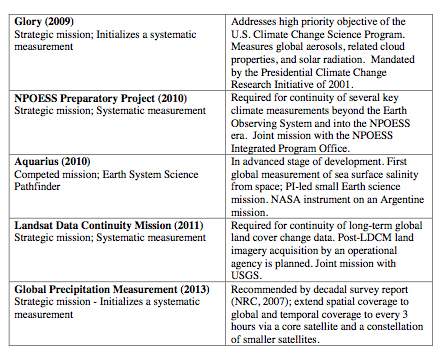 As is described in NASA's budget justification, these missions are fully supported within the request. These new missions are made possible within the out year projections in the FY 2009 budget request largely by the completion and launch of missions currently in development. NASA plans to launch more than 15 science missions over the next two years, creating the new mission opportunities the Agency and the community have regarded as critical to make further progress on the decadal survey priorities in each of the four science areas. Additionally, we are conducting studies of a host of other important new missions that we hope will reach new project status in coming years, including a new astrophysics mission to search for Exoplanets, a Mars Sample Return mission, two more Earth science decadal survey missions, and a future mission to study dangerous solar radiation. help ensure that the Vision for Space Exploration is successful by increasing the scientific yield it will produce. Further, I identified three areas for increased emphasis within NASA's budget for Science: strengthen investment in Research and Analysis (R&A); strengthen investments in mission data analysis to ensure that we get the best science value for the dollars we invest in missions; and, reinvigorate our program of suborbital research to train a new generation of researchers, advance technology development, and help bridge the 2010 to 2012 gap in orbital and planetary mission launches. I will now discuss how each of these objectives is being addressed in SMD. NASA contracts with the NRC of the National Academies to identify and develop scientific consensus planning documents for each of the four science disciplines (Earth Science, Heliophysics, Planetary Science, and Astrophysics). These documents have become known as the "decadal surveys" because they assess proposed activities and recommend investment priorities over a 10-year timeframe for each discipline. In effect, "advancing the decadal surveys", means pursuing the highest value science objectives for each discipline as established by a consensus of leading scientists in the discipline. The FY 2009 budget request includes $1.37 billion for Earth Science. This budget request represents a substantial step forward in responding to the recommendations of the first NRC Decadal Survey for Earth Science, released in 2007. The five-year budget runout requests $910 million for priorities enumerated in the survey and represents a major initiative in NASA to concentrate more heavily on Earth science at this critical time. This funding will support five Decadal Survey mission priorities, including the immediate start of two Decadal Survey new mission priorities --the Soil Moisture Active/Passive (SMAP) mission scheduled to launch as early as 2012, and the Ice, Clouds, land Elevation Satellite II (ICESat-II) scheduled to launch in 2015 - as well as formulation of two additional Decadal Survey missions and a Venture class mission also recommended in the Decadal Survey. The request also includes funding for over 1,700 research and analysis grants, the airborne program of Earth observations, the Applied Sciences program, and, seven missions in development which are important Earth science Decadal Survey precursor missions. The Landsat Data Continuity Mission (LDCM) and Ocean Surface Topography Mission (OSTM) will continue the decades-long time series of land cover change and ocean surface height data, respectively. The Glory mission targets the impact of aerosols on climate and extends the long time series of total solar irradiance measurements. The National Polar-orbiting Operational Environmental Satellite System (NPOESS) Preparatory Project (NPP) paves the way for the future national weather system and continues essential measurements from the NASA Earth Observing System (EOS). Aquarius and the Orbital Carbon Observatory (OCO) will make the first-ever global measurements of ocean surface salinity and atmospheric carbon dioxide, respectively. The request specifically increases funding for OCO and the Aquarius missions to maintain development schedules. The Global Precipitation Measurement (GPM) mission will make rainfall measurements on a global scale. The request retains the GPM core mission launch readiness date with a minor 4-month slip in the launch of the constellation spacecraft. As requested in the Subcommittee's invitation to testify, I have included a more detailed NASA Earth Science Architecture as Appendix I.
NASA is working closely with NOAA to restore climate sensors that had been removed from the triagency NPOESS effort under the Nunn-McCurdy recertification process in 2006. The FY 2009 budget request of $74 million for NOAA supports the addition of a Clouds and the Earth's Radiant Energy System (CERES) instrument onto NASA's NPP satellite, set to launch in 2010; instrument development and ongoing analyses to identify a suitable satellite platform for hosting the Total Solar Irradiance Sensor (TSIS); and development of climate data records. NASA is conducting development work on these sensors for NOAA on a reimbursable basis. In addition, NASA and NOAA are working together to initiate preparations for these sensors in FY 08. These actions will be implemented through close coordination between NASA and NOAA, and they come in addition to the inclusion of the Ozone Mapping and Profiler Suite (OMPS)-Limb sensor on the NPP satellite that was announced last year. NASA's role in the NPOESS program, in accordance with Presidential Decision Directive/NSTC-2, is to facilitate the development and insertion of new cost-effective technologies that will enhance the ability of the converged system to meet its operational requirements. NASA's primary stake in the NPOESS program is a scientific one: we look to NPOESS to provide long-term continuity of measurement of key climate parameters, many of which were initiated or enhanced by NASA's Earth Observing System. Toward this end, NASA has also entered into a partnership with the NPOESS Integrated Program Office (IPO) for the NPP satellite. NASA is committed to doing its part as a technology provider to make the NPOESS program, as restructured in the Nunn-McCurdy certification, succeed in collaboration with NOAA and the Department of Defense (DoD). The Government Accountability Office and the Department of Commerce Office of Inspector General have reported on the NPOESS program and produced a series of recommendations which NASA will review and carry forward as lessons learned for the future. In broad terms, the issue of transitioning from research to operational climate monitoring will clearly require the continued close attention of both NASA and NOAA. NASA and NOAA are meeting on a regular basis to address these issues. In addition, experience with NPOESS and NPP illustrates the potential risks associated with attempting to address multiple mission requirements using a single spacecraft platform. As is noted below, it is absolutely critical to assure that mission concepts under consideration match a realistic projected budget profile and to appropriately "size" a mission from the earliest design phase. Notably, the Earth science Decadal Survey explicitly ruled out "large facility class (cost greater than $1 billion) missions" as inappropriate for Earth science research missions. Second, we must also effectively track and manage cost and schedule throughout the development cycle, identify and trigger de-scoping options at appropriate times to maintain cost ceilings, and consider canceling missions when those ceilings are violated. NASA is developing increasingly disciplined approaches to mission review that extend across the program and project levels. The FY 2009 budget request for Astrophysics is $1.16 billion, which includes funding to initiate a Joint Dark Energy Mission (JDEM) in FY 2009 and to begin preparatory work to define a medium-scale exoplanet exploration mission to be initiated in FY 2010 and launched in the 2015 timeframe, for which a SIM-Lite concept and other exoplanet mission candidates will be considered. The request supports a restart of the Nuclear Spectroscopic Telescope Array (NuSTAR) Small Explorer with a launch date of no- earlier-than 2011. It also provides funding for the Kepler exoplanet search mission, which is planned for launch in February 2009 to detect planets in the "habitable zone" around other stars. The request further supports development of the Wide-field Infrared Survey Explorer (WISE), which will conduct an all-sky survey, and the James Webb Space Telescope, which will explore the mysterious epoch when the first luminous objects in the universe came into being after the Big Bang. With its first test flights completed, the Stratospheric Observatory for Infrared Astronomy (SOFIA) 747 airborne infrared observatory will begin early science observations in 2009. The Astrophysics suite of operating missions includes three Great Observatories (Hubble Space Telescope, Chandra X-Ray Observatory and the Spitzer Space Telescope), which have helped astronomers unravel the mysteries of the cosmos. The request will also support the Gamma-ray Large Area Space Telescope (GLAST), which is now planned for launch in May, 2008, to begin a five-year mission mapping the gamma-ray sky and investigating gamma-ray bursts. The request also increases funding for sounding rocket payloads, balloon payloads, detector technology and theory by augmenting Research and Analysis (R&A) funding by 35 percent over FY 2009 to FY 2012.
request also includes $68 million for Mars Sample Return mission advanced development. With the New Horizons spacecraft continuing on its way to Pluto, the request realigns the New Frontiers Program's Juno Mission to Jupiter to be consistent with a 2011 launch date and funds initiation of the third New Frontiers mission, as called for by the planetary decadal survey. An open competitive solicitation for this mission is planned for release near the end of this calendar year, and planetary science R&A funding is augmented by 31 percent over FY 2009 to FY 2012. The NRC recently completed a midterm review of progress against the Planetary Science Decadal Survey, now five years old. NASA will be responding to the NRC's assessment in a separate report in the coming weeks, but it is worth noting that our budget request addresses many of the issues brought forth in that report, including the delayed development of the Outer Planets Flagship, New Frontiers 3, and the need for increased R&A funds. Guided by the NRC's recent report: The Scientific Context for Exploration of the Moon, the FY 2009 budget request for Planetary Science includes a Lunar Science Robotic Mission Initiative funded at $60 million per year in FY 2009 to FY 2011, and at $70 million per year thereafter. NASA plans to launch a small lunar science orbiter by 2011 and two mini-landers by 2014. The mini-landers will function as nodes in a geophysical network, as called for in the NRC study. The FY 2009 budget request for Heliophysics of $577.3 million funds a new Solar Probe mission which has long been sought by the U.S. scientific community and is recommended highly by the most recent Heliophysics Decadal Survey. The request also supports 16 currently operational missions, which will be joined in 2008 by both the Interstellar Boundary Explorer (IBEX) mission focused on the detection of the very edge of our solar system, and the Coupled ion-Neural Dynamics Investigation (CINDI) "Mission of Opportunity" that will provide new insight on the Earth's ionospheric structure. In early FY 2009, the Solar Dynamics Observatory (SDO) to study the Sun's magnetic field is planned for launch, and the Geospace Radiation Belt Storm Probes (RBSP) mission will begin development. RBSP will improve our understanding of how the Earth's radiation belts are formed and how solar output modifies the Earth's radiation belts. RBSP will be augmented by the Balloon Array for RBSP Relativistic Electron Losses (BARREL), which was selected in late 2007 as a Geospace Mission of Opportunity. The FY 2009 budget request also increases budgets within Heliophysics for Sounding Rockets, Research Range, and R&A to achieve a more robust level of small payload opportunities. Funding for R&A is augmented by 22 percent over the FY 2009 to FY 2012 timeframe. The Heliophysics request fully supports the Explorer program, including the three new Small Explorer (SMEX) missions we are presently in the process of selecting for flight. It further includes funding for NASA's New Millennium Program, a crosscutting technology flight validation program with the overall goal of reducing risk and cost for science missions. However, this program has not been a cost effective mechanism for achieving this goal, and New Millennium's technology contributions to science missions have been limited, despite substantial investments. The Program has not contributed to reducing cost and risk for science Missions at a level commensurate with the resources dedicated to the program. In many cases, New Millennium has flown technologies that were not later useful for the science missions we build in response to NRC decadal surveys. Further, the resources required for launching and supporting New Millennium missions consume substantial resources which might otherwise be dedicated to technology development. In light of these facts, NASA has determined that it can achieve substantial improvement in technology development performance and application effectiveness by phasing out the New Millennium Program and integrating most technology development funds into the budgets for specific missions. We have already demonstrated this approach with the development of the James Webb Space Telescope and are now implementing this approach more widely so that we can get more science from the budget we have. The first step in controlling mission costs is to assure that mission concepts under consideration match available funding targets. Rather than selecting mission content up to the available funds or in anticipation of potential efficiency gains, we are now selecting mission content that leaves sufficient "head room" in the budget profile to deal with the future challenges that inevitably arise in developing missions that have never been done before. In Astrophysics, this means treating JDEM as a "Keplerclass" or mid size mission, while fully retaining its ability to meet the basic science requirements described in the Dark Energy Task Force Report established by the Astronomy and Astrophysics Advisory Committee and High Energy Physics Advisory Panel. Similarly, as we begin preparatory work on a medium-scale exoplanet exploration mission, we will size the science content and capabilities to fit within the available budget profile. In Heliophysics, a redesign of the Solar Probe mission to be executable within the available budget has resulted in Solar Probe Plus. The redesigned mission will use a series of Venus flybys rather than a single Jupiter flyby to provide the necessary gravity-assist to enable the probe to approach the Sun, lowering costs and producing quicker science return than had been possible previously. The new mission design substantially reduces projected costs by eliminating the need for radioisotope power systems and sparing the spacecraft from the extreme cold associated with a trip to Jupiter. The second step in controlling mission costs is to track and manage cost and schedule effectively throughout the development cycle, identify and trigger de-scoping options at appropriate times to maintain cost ceilings, and consider canceling missions when those ceilings are violated. In conjunction with this, we are developing increasingly disciplined approaches to mission review that extend across the program and project levels. For example, Kepler successfully passed its Critical Design Review (CDR), which marks the completion of the project's design phase and transition into the build up of flight hardware, in October 2006. However, certain problems continued, putting the overall mission at risk. Facing further potential cost growth of up to $54M, a Kepler project management meeting was held in Boulder, Colorado, on July 6, 2007, to examine the program's cost overruns and the program's plan for bringing the spacecraft to launch within the established budget. The plan included restructuring the project's management and changing or eliminating some tests or reducing their duration. No tests that affect the safety or ultimate performance of the system have been dropped, and all changes to the testing program were reviewed by multiple internal and external parties. The resulting plan has a healthy 24 percent reserves to launch. In addition, the lead industrial partner, Ball Aerospace & Technologies Corporation, gave up some of its earned fee on the project and the development schedule reserves were also refined. In order to keep the mission within its established cost cap, the total on-orbit observation time will be reduced by six months, but no significant science will be lost and the mission will be able to gather 90 percent of its planned data. The savings realized by avoiding a Kepler cost increase removed a threat to the Explorer Program budget and helped us re-initiate the NuStar mission, thereby getting more from the SMD budget. In May 2007, the SDO mission had incurred schedule slips against the August 2008 Launch Readiness Date (LRD) that exceeded reserves. Schedule flexibility had been exhausted by instrument and spacecraft difficulties and was not recoverable. The Project's first cut at a replan identified a proposed LRD of 3/1/09 at an additional cost of $46.3 million. That estimate was subsequently improved to a 1/15/09 LRD and cost increase of $39.3 million by immediately accepting hardware deliveries with acceptable performance, deleting internal schedule reserves on instrument deliveries, and using week-end and second shifts to meet near-term deliverables. Through further iterations with the project team, NASA identified a combination of low-impact schedule descopes and mission scope reductions that did not impact mission science objectives. The net result of these replanning efforts was a 60 percent cost reduction in the cost increase, from $46.3 million and a seven month launch delay to $18.1 million and a four month launch delay. At present, the project is maintaining schedule and working toward the approved Life Cycle Cost (LCC) of $805 million. NASA's approach to both the SDO and Kepler issues conform to the general principle that resources to solve project problems should come first from the mission lines or programs that include that project. Problems in programs and missions should be addressed within the Division (science area) in which they occur whenever possible. Further, we will not sacrifice the future to sustain significant budget overruns by missions in development. It is critical to the future of the program that we take these steps now to control costs and to establish a more disciplined program management regime. The FY 2009 budget request for SMD makes significant strides toward establishing a strong lunar research community. The request includes a Lunar Science Robotic Mission initiative funded at $60 million per year in FY 2009 through FY 2011, and $70 million per year beyond FY 2011. This effort builds on and will be highly complementary to NASA's existing lunar science research activities by providing a flight program that delivers exciting scientific results. The first mission, a small science orbiter called Lunar Atmosphere and Dust Environment Explorer (LADEE), will characterize the tenuous lunar atmosphere as recommended by the NRC. LADEE will launch by 2011, and an initial pair of surface geophysical mini-landers will follow by 2014. NASA is optimistic about the prospect of developing an International Lunar Network of geophysical landers and has already received positive feedback from a number of potential partners. The request also strengthens lunar science by providing support for the development of the newly selected Gravity Recovery and Interior Laboratory (GRAIL) Discovery mission, which will use high-quality gravity field mapping of the Moon to determine the moon's interior structure. We also established the NASA Lunar Science Institute (NLSI) at the Ames Research Center to jump start U.S. lunar science across the nation. NLSI will augment other, already established lunar science investigations funded by NASA by funding the formation of interdisciplinary research teams. Management of the NLSI will be modeled after the highly-successful focused research initiative of the NASA Astrobiology Institute (NAI), also managed at NASA Ames. Planetary Science R&A augmented 31 percent in FY 2009-FY 2012. R&A increases in the Earth science area will be evaluated in the coming year, as will the need for additional space science increases. To better evaluate the need for funds in specific scientific disciplines, we are developing "demand metrics" that help us guide funds to areas with the strongest scientific interest, and therefore with the strongest proposal pressure. In recent years, cost growth in large missions constrained opportunities for new small, Principal Investigator-led missions, creating an imbalance and limiting launch opportunities, particularly in the 2010 to 2012 time period. We have made substantial progress in addressing this issue by reinvigorating suborbital research to train a new generation of researchers, advance technology development, and help to bridge the 2010 to 2012 gap in orbital and planetary mission launches. This includes initiating seven new missions with the FY 2009 budget request, restarting the NuSTAR mission, selecting two new Scout (ExoMars 2013) and two new Discovery Missions of Opportunity (as two new assignments for the Deep Impact and Stardust spacecraft), and creating an annual Mission of Opportunity solicitation. The FY 2009 budget request increases budgets for Sounding Rockets, Balloon Payloads, Research Range, and Research and Analysis to achieve a doubled level of small payload suborbital research mission opportunities. It is worth stepping back to appreciate the breadth, depth and productivity of the NASA science program I am charged to lead. Not including the seven missions we are proposing to initiate in the FY 2009 request, we have 55 flight missions in operation, 30 missions in development, and over 3,000 ongoing research grants. The 14 on-orbit NASA Earth science research missions are producing definitive data sets that let us specify state of the planet and how the environment is changing. Heliophysics' 16 operating missions are revealing the behavior of our local star in detail. Missions to other planets continue to provide us with descriptions of the amazing diversity that we now know characterizes the solar system and tantalizing hints of environments hospitable to life. Our Astrophysics great observatories Hubble, Chandra, and Sptizer are probing the most profound questions of how the universe arose and evolved and our place in it. This program of research is far and away the worlds leading program. Historically, we are living through a truly spectacular age discovery in space, and the United States is leading these discoveries. We cannot only see more and farther and deeper than any other generation in history, we are learning more at an incredible rate. The Subcommittee and the American taxpayers you represent should be proud of the historic human achievement that our program represents. I certainly am, and I am committed to both inspiring the next generation of explorers with new discoveries and passing on a healthy and vigorous program of scientific exploration to the next generation of scientists. To address the challenges of recording simultaneous observations of all Earth components and interactions to generate new knowledge about the global integrated Earth system, NASA and its partners developed and launched the Earth Observing System and ancillary satellites. Fourteen satellites comprise today's NASA Earth Observing System. The scientific benefit of simultaneous Earth observation----the Earth System Science construct--is bearing fruit. For example, NASA's Aqua, Aura, Cloud-Aerosol Lidar and Infrared Pathfinder Satellite Observations (CALIPSO), and CloudSat satellites and France's Centre National d'Etudes Spatiales (CNES) Polarization and Anisotropy of Reflectances for Atmospheric Sciences (PARASOL) satellite, collectively known as the A-Train, are in specific orbits to record unprecedented atmospheric chemistry and composition observations over the same region within 15 minutes. The A-Train, a subset of EOS, is the largest Earth science space super-observatory flown to date. Seven missions are in formulation and implementation for launch during FY 2008-2014. The new observations will extend some of the measurements made by EOS and will observe new features of the global integrated Earth system. The enormous complexity of the Earth system presents a challenge for NASA within the Group on Earth Observations (GEO): to enable sustained simultaneous observations of all key variables needed to understand Earth's changing environment. NASA and its National Polar-orbiting Operational Environmental Satellite System (NPOESS) partners (NOAA and Air Force) are developing the NPOESS Preparatory Project (NPP) mission. NASA and the NPOESS program planned NPP as a risk reduction mission as well as the transition mission for a set of mature climate measurements from the EOS era to the NPOESS operational environment. When the NPOESS development encountered cost and schedule problems, the Nunn-McCurdy recertification process resulted in the de-manifesting of several climate sensors from the NPOESS system. These sensors included ozone profiling (OMPS Limb), Earth radiation budget (CERES), solar irradiance (TSIS), ocean altimetry (ALT), and aerosol polarimetry measurements (APS). NASAand NOAA have been working in cooperation OSTP to develop a plan for flight of these sensors. Agreement has been reached to re-manifest OMPS Limb on NPP via joint funding from NASA and NOAA, to re-manifest CERES on NPP, and to prepare TSIS for future re-manifesting. The decadal survey priorities are now NASA's principal determinant of the priority of Earth science satellite missions beyond 2010. The decadal survey recommended fourteen missions for NASA to launch during 2010-2020 and one mission for NASA to jointly implement with the National Oceanic and Atmospheric Administration (NOAA) for launch in 2010-2013. NASA missions were grouped into three periods --near-term, midterm, and late-term. In contrast to decadal surveys in other areas of NASA science, the Earth science Decadal Survey recommended an integrated slate of missions rather than a list of missions prioritized scientifically from the top down with an expectation they be pursued to the limit of funds available. In the NRC's view, doing some missions but not others would break the observing strategy they proposed, requiring a reassessment. Further, the survey recognized the importance of the synergies between the flying research and operational missions--synergies that would be lost if the timeline for the decadal survey missions is greatly extended. Thus, NASA is pursing all four of the missions identified in the NRC's first time block and planning technology investments and other preparatory analyses for the others. The NRC explicitly ruled out "large facility class (greater than $1.0 billion) missions" as inappropriate for Earth Science. The next two decadal survey missions to be implemented will likely be the Climate Absolute Radiance and Refractivity Observatory (CLARREO) and the Deformation, Ecosystem Structure, and Dynamics of Ice (DESDynI) mission, with the order of these two yet to be determined. It is planned to start both by 2012, and to launch one by 2017 and the other by 2019.